Most Scottish place-names are descriptive, but not all are literal. Something we’ve become very aware of through the REELS project is the large number of metaphorical place-names in our study area. Eccles parish is not unusual in containing at least a dozen, including Caldron Pool, Cocked Hat Cover, The Kaims (‘combs’), Puncheon Bridge (apparently named from a resemblance to a puncheon, i.e. pointed tool), and Ship End – explained in the Ordnance Survey Name Book as “a breakwater faced with wood, and said to resemble the stern of a ship”. Metaphor is prevalent in ordinary language as well as in place-names, and a freely available online resource now makes it possible to trace all metaphorical connections between semantic fields throughout the history of English. 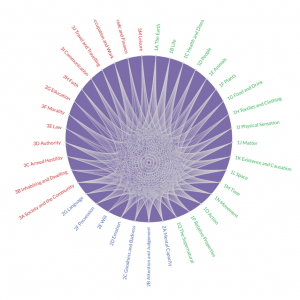 The resource comprises a pair of online Metaphor Maps, produced by the AHRC-funded project “Mapping Metaphor with the Historical Thesaurus” (PI Wendy Anderson) at the University of Glasgow. The Metaphor Map of Old English http://mappingmetaphor.arts.gla.ac.uk/old-english/ covers the Anglo-Saxon period, while the Metaphor Map of English http://mappingmetaphor.arts.gla.ac.uk/ covers the period from Middle English up to the present day. Each Map divides the semantic space of English into three main parts: the External World (green), the Mental World (blue) and the Social World (red). These in turn are divided into sub-sections and categories, with links between them representing metaphorical connections. Using this interactive resource, we can establish that caldron forms part of a wider network of words for containers applied to landscape, which also includes basin, bowl, kettle, pot, trough and others, and is evidenced as far back as Old English (e.g. OE byden). Other metaphors occur mainly or exclusively in place-names, although – like Cocked Hat Cover, The Kaims, Puncheon Bridge and Ship End – many are motivated by shape, one of the most productive sources of metaphor in both Old and later English. The REELS team uses maps extensively: mostly historical maps, either printed or online. The Metaphor Maps are a very different kind of map, and they add a new dimension to the study of language. Happy New Year from the REELS team! 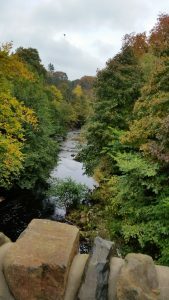 We’re now entering the second year of the project, using Berwickshire place-names to investigate the Northumbrian dialect of Old English and its development into Older Scots. We’ll keep you posted on progress, and will be delighted to hear from you. In the meantime, anyone looking for a more general introduction to the Anglo-Saxons and Old English might be interested in the “Learning with the Online Thesaurus of Old English (TOE)” resource at http://oldenglishteaching.arts.gla.ac.uk/. A revised and updated version was launched yesterday, and – as before – includes exercises, ideas for projects, and lots of fascinating information. Unit 11 “Landscape” is particularly relevant to place-names, but the whole resource is designed to explore aspects of Anglo-Saxon language and culture through the study of Old English vocabulary. Other units include “Life in Anglo-Saxon England”, “A Short Description of Old English, “The Vocabulary of Old English”, “Farming”, “Food and Drink”, “Plants”, “The Universe”, and many more. Enjoy! Author Carole HoughPosted on January 7, 2017 Leave a comment on Happy New Year! 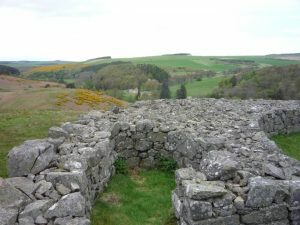 Edin’s Hall ‘(Fort & Broch)’ is a remarkable monument situated on the north-east slope of Cockburn Hill above the Whiteadder Water. Possibly dating from the Roman Iron Age (Canmore website), the interpretation both of the site itself and of its name is problematic. I will leave to the archaeologists the arguments as to what its original purpose was, when and for whom it was built and whether or not it is a broch as opposed to a ‘complex Atlantic roundhouse’ (see NMRS Canmore ID 58777). As to the name, our earliest record is from Armstrong’s map of 1771, when it appears as Wooden’s Hall or Castle. Here Wooden has nothing to do with the adjective ‘wooden’ – Edin’s Hall is entirely of stone. Rather it is a form of the Old English god Wōden, the god of wisdom and poetry who appears in the Norse pantheon as Odin. Clearly it was thought that only a god could have built such an impressive and unusual structure. However, by the 1790s the name Wooden’s Hall was falling out of fashion. We know this because the minister of Duns, Rev. Dr Robert Bowmaker, writes in the Old Statistical Account: ‘by some called Wooden’s hall, but commonly called Edin’s or Edwin’s hall’. In this way he associates it with the famous king, Edwin, 616-32 AD, the first Christian king of the Northumbrians according to the early eighth-century scholar Bede. By the twelfth century it was generally thought that Edinburgh itself took its name from him, being originally *Edwinsburgh. This idea still persists to this day, but Edinburgh originally meant ‘fortification (Old English burh) associated with an area or province called Eiddyn’, Eiddyn itself being a Brittonic (Old Welsh) name of unknown meaning. It is perhaps no coincidence that the Rev. Dr Bowmaker preferred the name associating the fort in his parish with a great Christian king than with a pagan deity! So in this name we have several layers of re-interpretation. The use of the element hall is also noteworthy. 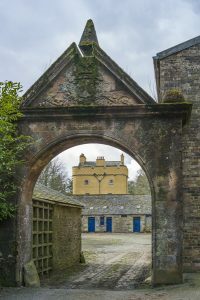 Originally hall meant ‘a high-status dwelling such as a big hoose or castle’, but later (i.e. from about the 17th century onwards), it was often applied ironically, with humorous effect, combined with elements describing poor land, such as whinny ‘associated with whin or gorse’, or bog; also vegetables, such as cabbage or sybie (spring onion), or birds, such as laverock or lark, or corbie (crow). 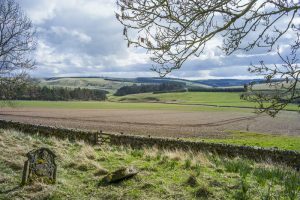 Examples of this can be found in Berwickshire in names such as Partanhall (Ayton parish), containing Scots partan ‘an edible crab’ or Cloverhall (Eccles parish). In the name Wooden’s Hall, later Edin’s Hall, given that it has been a ruin for many centuries, albeit an impressive one, it is difficult to know just how hall was being applied, whether or not tongue in cheek. Edin’s Hall ‘Fort & Broch’: part of the walls, looking north, with Retreat House clearly visible on the Whiteadder Water below. Photo: Simon Taylor. October 2016 saw members of the REELS team visit North Berwickshire en route home from attending a day conference in Newcastle organised by the Society for Name Studies in Britain and Ireland. Dr Simon Taylor and Dr Leonie Dunlop (formerly of STIT, the precursor project to REELS) contributed papers. 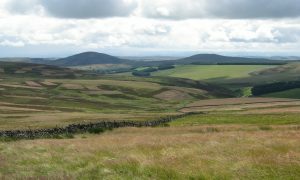 Our objective was to conduct fieldwork and to enjoy the view of the rolling Lammermuir scenery and areas to the south from the top of Dirrington Great Law, a conspicuous hill of 398m situated 2.49km SSE of the village of Longformacus LMS and from its nearby smaller twin, Dirrington Little Law (363m), some 2km to the SW. 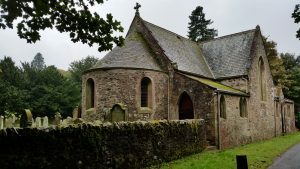 The forecast was not auspicious, but undaunted we briefly explored the mid-18th century parish church, with its simple Romanesque features and interesting gravestones, before journeying on to begin an ascent of the Great Law itself. Longformacus Parish Church. Photo Dàibhidh Grannd. If you aren’t familiar with the hill-bagging terms such as Marilyn, Hump and Tump then the Online Database of British and Irish Hills is a good place to begin. According to the database, Dirrington Great Law qualifies as all these three types of hill, being higher than 150m on all sides and having a top separated from other tops by more than 30m. It is even distinct enough to warrant its very own Wikipedia page. The eponymous(?) Dye Water at Longformacus. Photo Dàibhidh Grannd. Dr Taylor is keen to re-examine this theory, suggesting instead that Dye Water, the major watercourse nearby, may also contain the same element as found in the Dirrington laws. 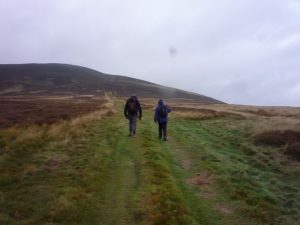 Dr Eila Williamson and Dàibhidh Grannd beginning the walk up Dirrington Great Law. Our expedition too had a somewhat watery ending as is evident from the picture below. Nevertheless it was a most enjoyable day out. 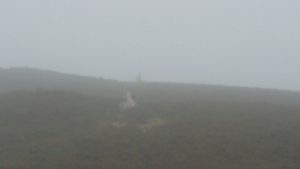 Dr Simon Taylor approaching the summit of Dirrington Great Law through low cloud. (1) Kelso Lib.i no. 140, dated 1198 x 1214. (3) Kelso Lib.i no. 143, dated 1203. (4) Kelso Lib.ii no. 460, dated 1243 x 1254. (5) Papal confirmation of Kelso Lib.ii no. 460, dated 1243 x 1254. (6) Williamson, M. (1942) The Non-Celtic Place-Names of the Scottish Border Counties, p55. PhD. University of Edinburgh. In March 2016 I visited Cranshaws, a rural parish in the Lammermuirs with no village within its bounds. 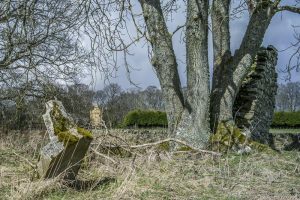 The remains of the medieval kirk lie in an old graveyard on a broad, relatively open slope about 1 km west of the Whiteadder Water, and about 200 metres south-east of Cranshaws Castle (see the accompanying photos). The name first appears in the mid-13th century as Craneschawes / Cranessawys’ / cranschaus, with reference to the church. One of the problems with analysing Berwickshire place-names like Cranshaws is trying to decide which language to assign their origins to. They could be Old English names, coined when Berwickshire formed part of the kingdom of Northumbria from about the 7th to the 10th centuries A.D. Or they could be later, when this northern form of Old English had evolved into the language now referred to as Scots. A rule of thumb is that those names attached to medieval parishes and other central places are more likely to go back to the Northumbrian (Old English) period, while names attached to minor features such as wee burns or hillocks are more likely to be later Scots coinings. This leaves a lot of names in between these two extremes, and an important part of the REELS project will be to try to define the Berwickshire name-stock more accurately in terms of language of origin. However, as far as Cranshaws is concerned, the working assumption is that it was coined in the Northumbrian period. So how should we analyse this name? The first element is Old English cran ‘a crane’, the magnificent bird which until the early 16th century bred in Britain and which would have been a familiar site in the landscape of both Scotland and England. One of the main ways we can judge just how widespread and conspicuous these birds once were is from the many place-names that contain references to them. An article by S. Boisseau and D. W. Yalden from 1998 tells us ‘The former status of the Crane Grus grus in Britain’ identifies around 300 such place-names. And there are no doubt many more still to identify (a recent one we can add to this corpus is the lost name Cairnbriggs by St Monans in Fife. The second element is Old English sceaga (Scots shaw) ‘a small wood, a copse, a strip of undergrowth or wood’. It is not clear whether the original name was in the plural, though it certainly is by the time the name is first recorded. If so, then it would refer to more than one clump of woodland. 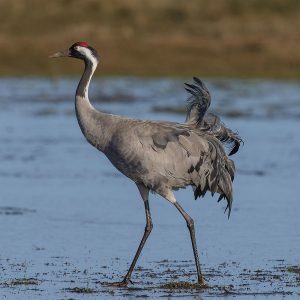 So the name can be interpreted as ‘a small wood or woods associated with cranes’, and through it we are transported back into the first millennium A.D. to a relatively open landscape dotted with small clumps of woodland, where cranes were often seen, and presumably also bred. The photos were taken by my old friend Alan McQuillan, who along with his partner Minie Smith accompanied me on my visit. The ruins of the old kirk of Cranshaws, with Cranshaw Castle in the distance. Photo: Alan McQuillan. Looking south-east from the edge of the old kirkyard of Cranshaws down the gently sloping fields to the Boontree Burn flowing eastwards to join the Whiteadder Water at short distance beyond the gap in the trees. Photo: Alan McQuillan. Cranshaws Castle. Photo: Alan McQuillan.